Alan Black was born in Garden City and now lives in Ypsilanti, Michigan. Never afraid to be his own punchline, Alan's likable and uncompromisingly honest take on life has been seen at LaughFest in Grand Rapids, 50 First Jokes at the Ark in Ann Arbor, and at clubs all over the state. In 2010, Alan won the World Dreidel Championship and has been chasing similar glory ever since. 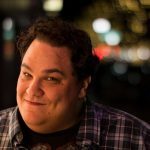 Alan co-hosts the Tap Room Comedy Night in Ypsilanti, and has appeared in comedy shows across the state including Laughfest, and at the Michigan Theater in Jackson.